About - Battle Creek Tile & Mosaic Co., Inc. Serving you with integrity and trust. 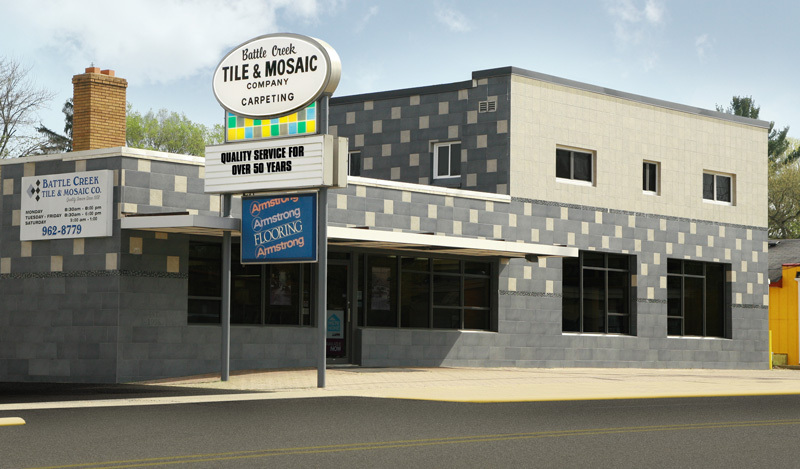 Santo Zanetti established Battle Creek Tile at the current location of 1338 W. Michigan Avenue in Urbandale in 1958. The store, which started out as a commercial floor covering store entered the residential sector when their commercial clients requested those services also. As the residential and commercial businesses grew a need for expansion occurred 5 times to the present show rooms and warehousing structures. Beside serving their loyal customers in Battle Creek and Southern Michigan Battle Creek Tile has had the privilege to have been involved in projects as far as Florida, Pennsylvania, Indiana, Ohio, Tennessee, Nebraska and Mexico. Along with product knowledge and customer service, keys to the continued success of Battle Creek Tile has been their association with quality suppliers and people. The values that the Zanetti’s have of others extends to the people who have worked with them since the opening in 1958. Currently the staff consists of brothers Frankie and John Zanetti (sons of Santo), Frankie’s daughter Alissa in sales and management, John’s son in-law Will Miller with Mike Staib and Robin Woods in sales and Aaron LaLonde and Michelle Knox as office managers. For over 60 years the success of Battle Creek Tile can be directly attributed to the hard work, talents and commitment of the Zanetti family and of some of the most talented craftsmen around to provide you with the most current and innovative products available in the floor covering industry.